Pick broom flowers that have opened and place them in a bucket with the juice of the oranges and lemons. 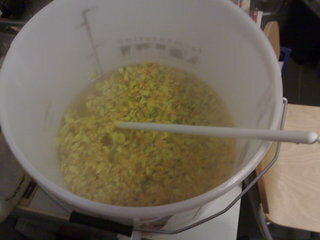 Boil the water with the sugar and the zest of the oranges and lemons. Pour onto the broom flowers and stir well. Put the yeast on to start. Whenthe liquid has cooled to blood heat, add the yeast and leave it to ferment for 4 days in a warm place. 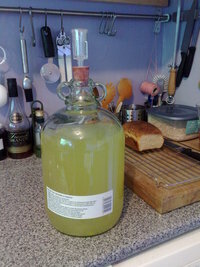 Then strain off the solids and transfer to a fermenting jar with an airlock. When the wine has completely stopped working, filter it off and bottle in sterilized bottles and cork with sterilized corks. The Broom gives this wine a very strange dry flavour in the mouth. It may be necessary to sweeten the wine a little to combat this. Finally bottled this wine, it had been sat in the airing cupboard for the last year or so quite happily. Fortunately it cleared really well, and had very little sediment, meaning I didn't bother racking it off. All in all I ended up with 4.5 bottles of wine. Taste wise, it is a very light, flowery tasty, not to sweat, not to dry. I quite like it and think I will make a batch next year. All in all, a success. Fermentation is continuing nicely, the demijohn has cleared to a nice colour, I need to rack it into a clean demi john this week tho. Looking good. Having successfully procured some demijohns, I have racked the must from the bucket into its demi john, which is fitted with an air lock. It is now ready to go in the airing cupboard for the next 6 months. It has an interesting smell, and the small amount I inadvertently got to drink whilst siphoning tasted ok, but very sweet. Will see what it is like once the yeast has done its magic. Due to a minor procurment mishap (i.e. I didn't have any demijohns and the shop was out of stock), rather than decanting the wine into a demijohn ready for its fermentation, I have moved it into a small 1 gallon bucket where it seems quite happy. The Must just after the liquid has been poured on. I had planned to make Gorse flower wine, but when I got to my chosen forage spot I discovered that I was to late for the gorse but just in time for Broom. Picking 4pt of broom flowers is surprisingly laborious, It is however a wonderful way to spent an hour or so on a spring evening. This page last modified Friday, 23-Jul-2010 02:07:35 CEST.